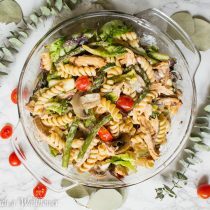 Pasta salad filled with shredded chipotle chicken, lettuce, grape tomatoes, and roasted vegetables. This chipotle ranch chicken pasta salad is delicious, easy to make, and perfect for summer picnics. Happy Sunday! I hope you had a great weekend! I’ve been excitedly waiting for this weekend because of the Nor Cal Night Market in Pleasanton. It’s kinda far for me, but the idea of nearly 100 food vendors from all the over the Bay Area gathering in one place and selling their best sellers is just too tempting for me to resist. Sooo…. I’m planning to go. Lol. In the mean time, let’s talk about this chipotle ranch chicken pasta salad. 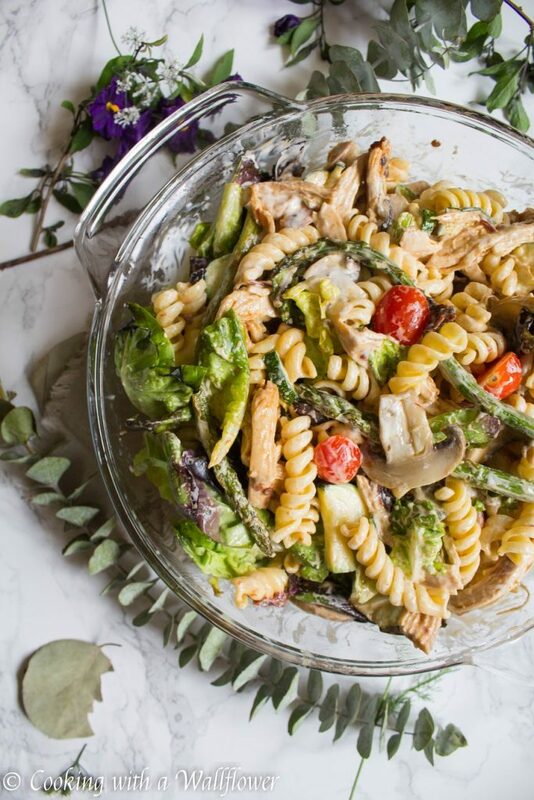 I’ve been obsessed with pasta salads lately, mostly because they’re so simple to make and so delicious. They’re also super easy to pack to bring with to a picnic or to a summer BBQ. I absolutely love the creaminess from the ranch and the slightly smokiness and spiciness from the chipotle marinated chicken. 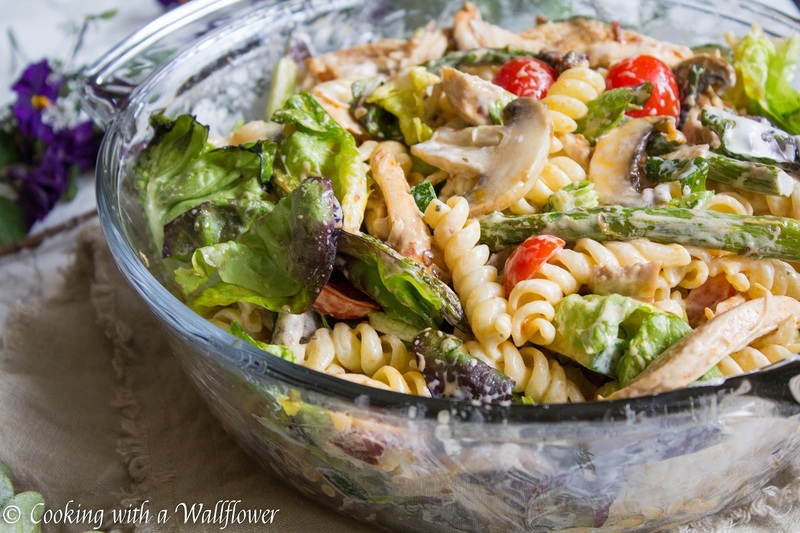 This pasta salad is packed full of flavors. And I can’t help but want this for every meal. 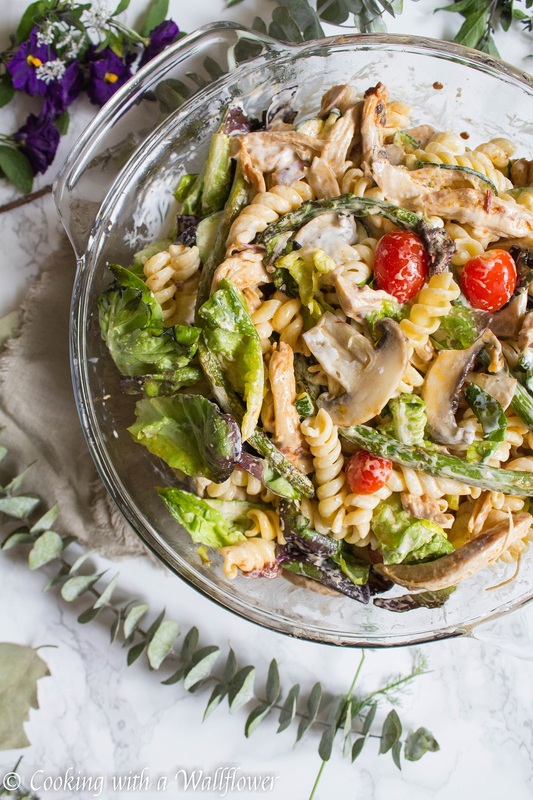 Mostly because it’s summer and a cold satisfying pasta salad sounds so perfect for me. You can also refrigerate the leftovers and pack it for lunch the next day. I love how the flavors meld together so well, especially overnight. Preheat the oven to 400F. Lightly grease a baking tray with nonstick cooking spray or a drizzle of olive oil. 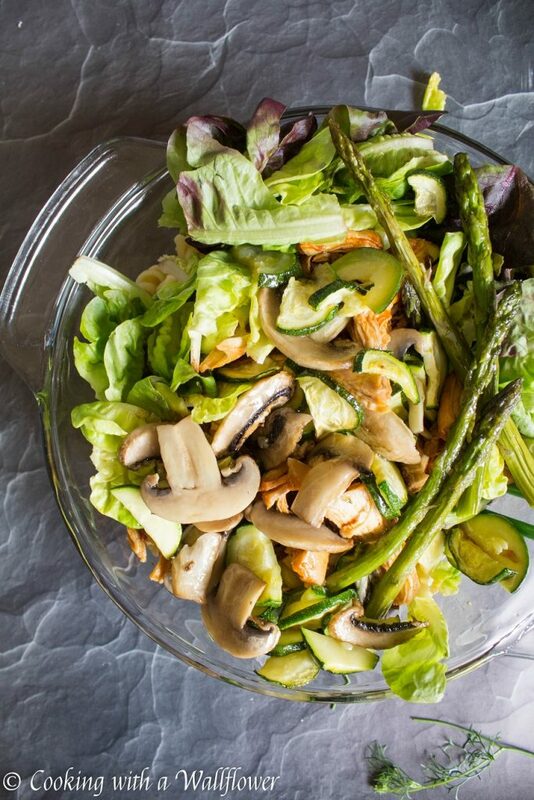 Place asparagus, mushrooms, and zucchini in a single layer. Roast the vegetables for about 15-20 minutes until tender. Other ideas for vegetables can include onions and carrots. Or, if you prefer, just throw everything on a grill. Since I don’t have a grill, and I live in San Francisco where it’s foggy all the time, I used the oven. Once the vegetables are done, set them aside for now. 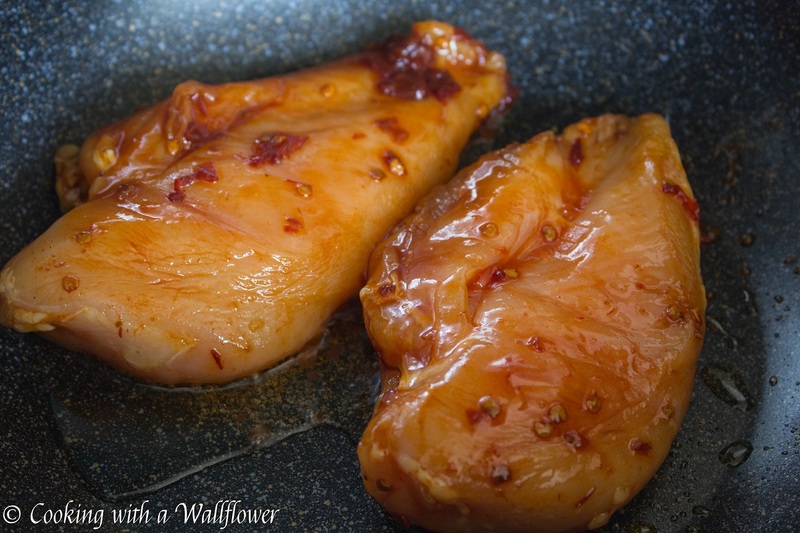 Marinate the chicken in honey, chipotle peppers, adobo sauce from the chipotle peppers, and salt. 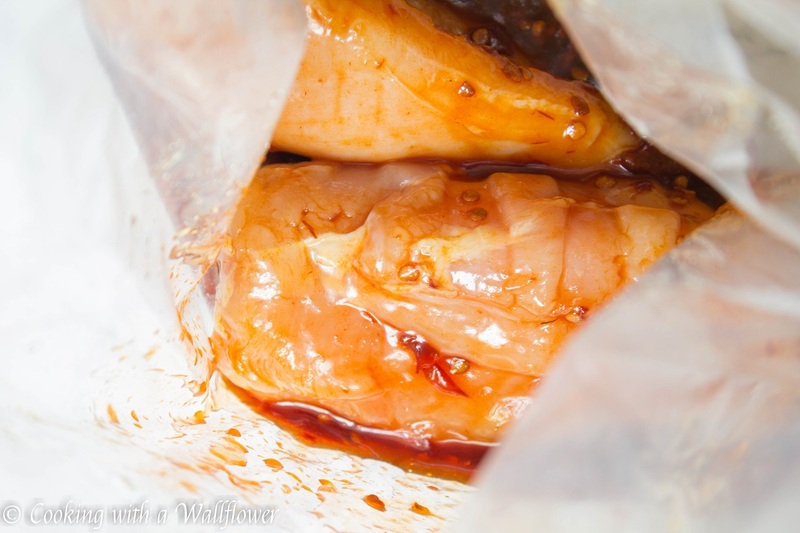 The longer you marinate the chicken the better. But you can just do a quick marinade and then pour the sauce into the skillet to cook with the chicken. Heat olive oil in a medium sized skillet for about a minute. Add the chicken to the skillet and cook over medium to high heat for about a minute or two before flipping to the other side. Cook for another minute or two. Add the rest of the marinade into the skillet and then cover tightly with a lid. Lower the heat to about medium and cook covered for about 10 minutes. 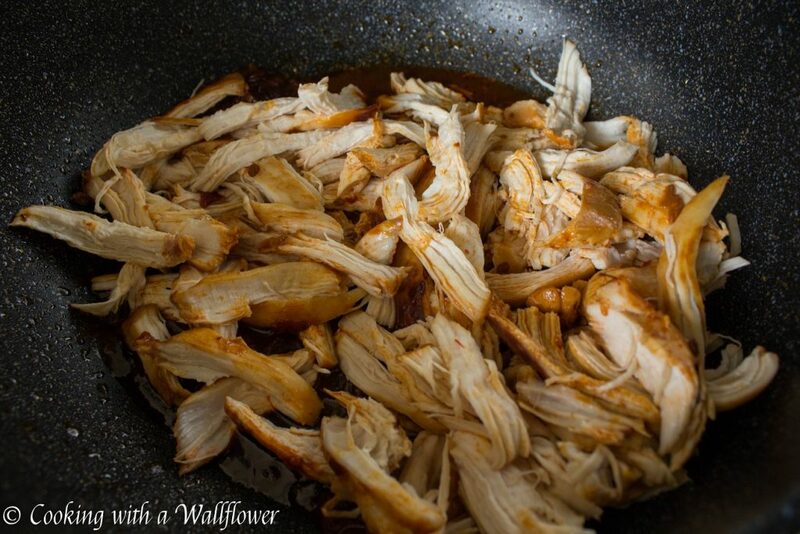 Then turn off the heat, and let the chicken sit for an additional 10 minutes with the skillet still tightly covered. The heat will continue to cook the chicken and allow it to remain tender. Once the chicken has cooled, shred the chicken and mix in the chipotle sauce so that the chicken is covered in the sauce. In a medium pot, heat water and cook the pasta according to the directions on the packaging. I prefer the pasta in my salad a little softer. Drain the water. Run the pasta through cold water. 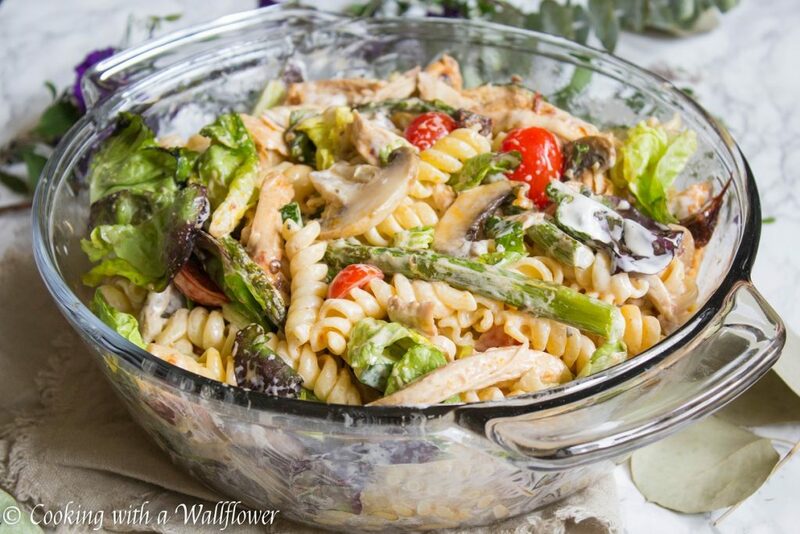 Add the pasta, shredded chicken with all the sauce, roasted vegetables, roughly torn butter lettuce, chopped tomatoes, and ranch into a large bowl. Toss and mix until all the ingredients are well combined. Serve the chipotle ranch chicken pasta salad cold. Preheat the oven to 400F. Lightly grease a baking tray with nonstick cooking spray or a drizzle of olive oil. 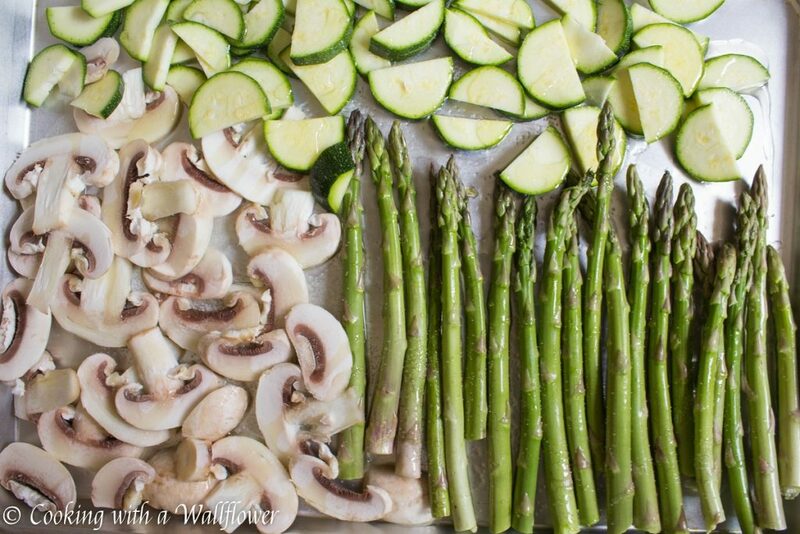 Place asparagus, mushrooms, and zucchini in a single layer. Roast the vegetables for about 15-20 minutes until tender. Other ideas for vegetables can include onions and carrots. Or, if you prefer, just throw everything on a grill. Once the vegetables are done, set them aside for now. 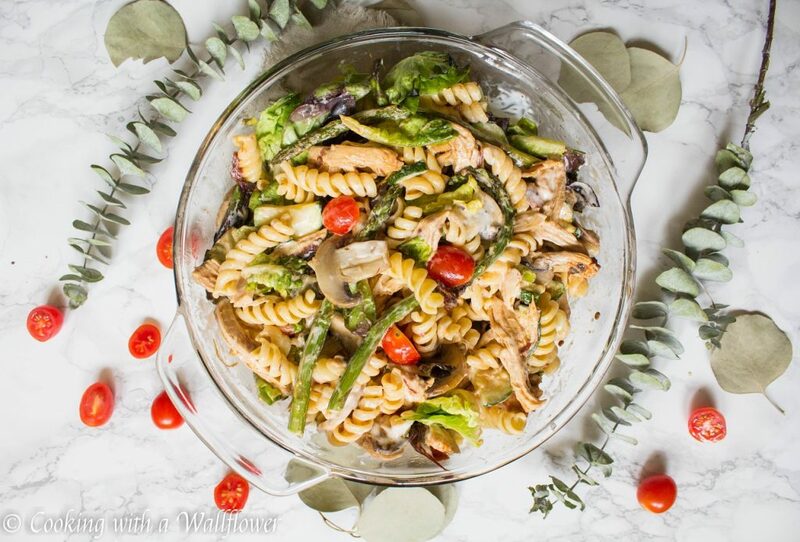 This entry was posted in Entree, Farmer's Market, Pasta, Quick and Easy, Recipes, Summer Cravings and tagged entree, farmer's market, honey chipotle chicken, pasta salad, picnic food, quick and easy, summer eats. This looks so good! Just looking at the photos makes me hungry! I saved this to Pinterest. Yum!